WILSONVILLE, Ore., April 16, 2015 /PRNewswire-iReach/ — RevMedx, Inc. today announced the company’s first shipment of its XSTAT™ hemorrhage control device to the US Military. This shipment marks the first complete production run of XSTAT in the company’s history and the first commercial availability of XSTAT for the global market. 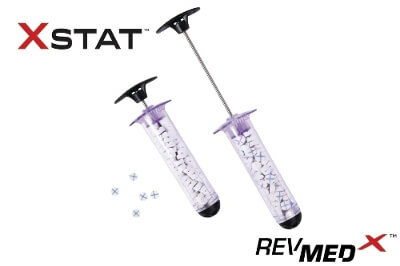 “We are pleased to have reached this important milestone of launching XSTAT” said Andrew Barofsky, CEO and President of RevMedx Inc. “We designed the XSTAT with direct input from military medics and first responders to provide a unique solution to the issue of junctional hemorrhage. We are looking forward to creating new and exciting products based on the XSTAT concept” said Barofsky. XSTAT, recently cleared by the FDA, is a first-in-kind hemostatic device for the treatment of several bleeding in the axilla or groin area (known as junctional wounds). It consists of a 30mm diameter syringe filled with compressed mini- sponges that, when in contact with blood or fluid, expand up to 10x their size. These sponges are designed to create a temporary barrier to blood flow and provide hemostatic pressure until the patient can receive surgical care. Each mini-sponge contains a radiopaque marker for easy detection with x-ray imaging. Based in Wilsonville, Oregon, RevMedx is a privately held medical device company whose goal is to design, develop, and manufacture innovative medical products that solve real-world issues in the prehospital and battlefield arena worldwide. Our product line is focused on unique solutions to hemorrhage control that provide quantum-leap changes to first responders in time of application and reduction of blood loss in the field. Our product line includes XSTAT, XGAUZE™ , AirWrap™ , and TX Series Ratcheting Tourniquets. Additional information about RevMedx and our products can be found at www.revmedx.com.